A photovoltaic system will deliver a visible and smart building material which actively reduces your building’s carbon dioxide emissions, while at the same time providing you with inflation-proof electricity at the point of demand. With photovoltaic panels guaranteed by a manufacturer’s warranty to continue producing electricity for at least 20 years, and with the pervading economic and regulatory shift towards positive environmental practices, investing in a solar photovoltaic system now could reap benefits for years to come. With electricity prices likely to rise in time due to supply shortages of fossil fuels, a photovoltaic installation is an investment worth considering for any new build, renovation or retrofit project. The average cost for electricity is currently about 13p/kWh and this has increased by roughly 7% each year for over a decade. It is estimated that a medium use household will use approximately 3300kWh/year of electricity. A typical 1.8kWp domestic Solar PV System can provide over 45% of this demand. Not only are you saving money by not having to use as much energy from the grid, but most utility companies now pay you for generating your own green energy. They do this because they have renewable energy targets to achieve. Electricity prices have risen by approximately 7% every year for over a decade. The demand for electricity has also grown substantially over the past few years. The residential sector is largely responsible for this increase. 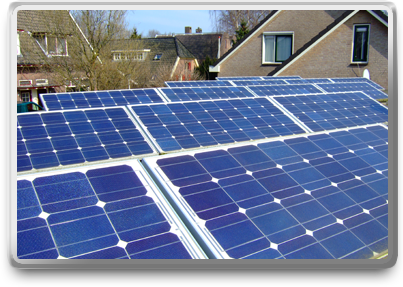 Solar PV systems can be designed so that a household’s electricity demand is wholly or partly met. This can eliminate or reduce your dependency on grid supplied electric. Once your Solar PV system is installed and paid for- the electricity it generates is produced at a constant cost. On an average system electricity is produced at approximately 18p/kWh. * Although this is slightly more expensive than the cost from the grid- this price is guaranteed for the life of your system. So in 30 years time electricity will still be costing you 18p/kWh. If the current average price for electricity (13p/kWh) continues to increase at 7% a year, your green Solar PV electricity will be cheaper in less than 5 years time! That is assuming it only increases by 7%- what will happen if it rises at a faster rate? In the U.S. the National Appraisal Institute’s Appraisal Journal from 1999 stated that the value of your home increases by approximately £10 for every £0.50 reduction in annual utility bills. Based on this an average 1.8kWp Solar PV system could increase the value of your house by over £4,000. However, no official studies have been carried out in the UK to show how Solar PV affects the value of your house. Currently you can get a better rate of return by investing your savings into a Solar PV system rather than putting it in a bank account or an ISA, speak to our solar experts to find out more about this. The return rate on your solar PV installation will potentially increase yearly if the price of electricity rises. For more information on the returns you could recieve, call us today. An average 1.8kWp Solar PV system can reduce your household carbon emissions by over 900kgCO2/yr. Once your Solar PV system has been installed and is up and running, producing electricity from Solar PV does not emit any harmful emissions. Solar PV is made from a Plentiful Resource: Most Solar PV panels are made of silicon which comes from sand and plenty of this resource is available. Solar PV has been proven to be a reliable technology. Most solar panel manufacturers give between 20-25 year cell warranty for their products. A Solar PV system has no moving parts therefore very little maintenance is required. This coupled alongside the long expected life-time of a system means that once installed that’s practically everything sorted for at least 25 years.